An average of 2,000 strong earthquakes and large volcanic eruptions occur every year all around the world. Throughout history, people have been all too familiar with the deadly power and seemingly unpredictable nature of these events. But in the last few decades, scientists have been able to track these geologic activities, and they have discovered that their occurrence is, in fact, quite orderly. Both earthquakes and volcanoes are largely restricted to narrow, overlapping zones. This observation helped lead to the development of the grand unifying theory of earth science, the theory of plate tectonics. 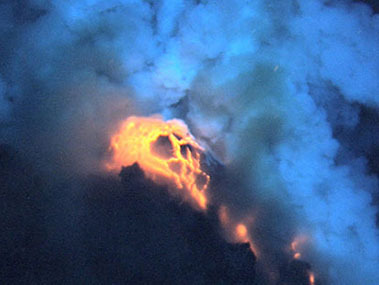 NOAA’s Submarine Ring of Fire expeditions have helped illuminate the dynamic forces at work along mid-ocean ridges. 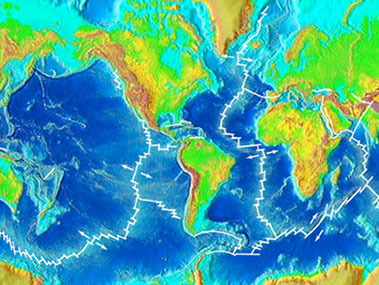 The nearly continuous, global mid-ocean ridge system snakes across the Earth’s surface like the seam on a baseball. It is clearly visible on this map of global topography above and below sea level. The ridge system forms the longest and largest mountain range on Earth. It winds its way between the continents and is more than 65,000 kilometers long and 1,500 kilometers wide. Where tectonic plates collide, enormous geologic forces are unleashed. Earthquakes strike, volcanoes erupt, and mountains rise. Although scientists are well aware of the power of collision, they are still seeking to understand the processes involved. Because of their grand scale and great depth, plate movements are often difficult to study, especially when they occur under the sea. One important tectonic process that occurs only beneath the ocean is called subduction. 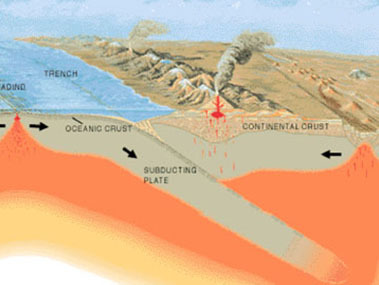 Subduction occurs when two plates collide at a convergent boundary, and one plate is driven beneath the other, back into the Earth’s interior. Dry land on Earth exists only because continents are born and kept above sea level by the volcanism and mountain building that occurs at subduction zones. Just a few decades ago, submersibles and remote sensing technologies allowed scientists to visit the farthest reaches of the ocean for the very first time. Of the many wonders they discovered, one of the most surprising was the existence of rich clusters of life flourishing in the darkness of the deep sea floor. The inner workings of these ecosystems have proved to be as unusual as their location, for they are powered not by the light of the sun but by the heat of the earth. At the heart of these deep-sea communities is a biological process called chemosynthesis, which can sustain life in absolute darkness. 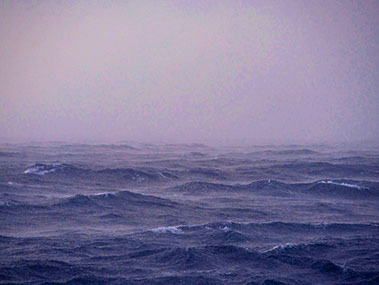 Scientists call the open ocean the Earth's last frontier—a distant and mysterious realm that resists our efforts to explore and understand its resources. And yet, it covers more than two-thirds of the world. The deep seafloor—the part of the bottom lying off the edges of the continental shelves—makes up nearly 60 percent of the planet’s surface. At the bottom of the sea, the benthos—the scientific name for all the organisms living on and in the seafloor—must cope with extreme physical conditions. 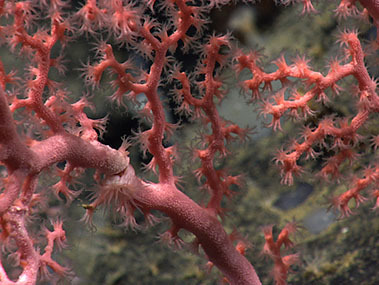 Although the seafloor is the world’s most widespread habitat, it is also one of the least hospitable—cold and dark, nutrient-poor, and bearing the tremendous weight of the ocean. Seen from space, Earth is a cool blue oasis, bathed in water, decorated by clouds. For at least the last billion years, a staggering 326 million cubic miles of water has filled the oceans and rained from the skies. Every drop is ancient, nearly as old as the Earth itself. The water running through your faucet today also fell as rain on ancient civilizations, was swallowed by a thirsty dinosaur, and rolled across an empty beach long before the dawn of life. This complex, constant movement of water on Earth—from the oceans to the air, across the landscape, and through plants and animals—is called the water cycle. Even the most casual observer is impressed by the swirl of tides or the march of waves against the shore. But few note the silent, subtle passage of currents. Yet the power of currents to move and control the seas is unmatched. Currents are cohesive streams of seawater that circulate through the oceans. Some are short-lived and small, while others are vast flows that take centuries to complete a circuit of the globe. The Gulf Stream Current, which shows up in this temperature coded satellite image as a broad dark orange swath, has followed this course through the North Atlantic for millennia. The sea is rarely still—row upon row of waves roll across its surface, seemingly endless and eternal. At turns soothing, exhilarating, and terrifying, waves carry the power and the beauty of the sea and let them loose upon the shore. A wave is a complex mix of water and energy. Anyone who has watched breakers roll into the shore, or been seasick on a boat, knows very well that waves move. But surprisingly, the water in waves doesn’t travel much at all. The only thing waves do transmit across the sea is energy. Waves concentrate the power of the wind, of earthquakes, and of undersea volcanoes on the thin strip of rock and sand that guards the edge of the continent. The great English poet, Geoffrey Chaucer, wrote “Time and tide wait for no man.” Like time, the flow of the tides is steady, predictable, and unstoppable. Tides are the regular, alternating rise and fall of sea level caused by the gravitational pull of the moon and sun. The changing of the tide is often rapid and dramatic. 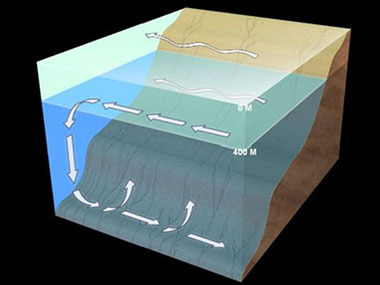 On a smaller scale, similar motions occur on large lakes, in the atmosphere, and even within the solid earth. 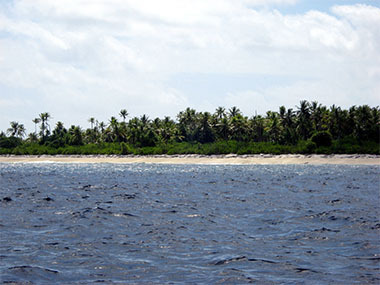 In all of these circumstances, the once or twice daily rise and fall of sea level poses enormous challenges and opportunities for the plants and animals that live in the dynamic space between high and low tides. The ocean has long been a source of bounty, supplying mankind with basic needs like food and transportation, and delighting us with its beauty and wonder. 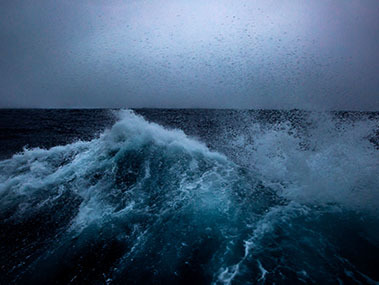 Man is now turning to the seas once again, seeking another vital resource – energy. 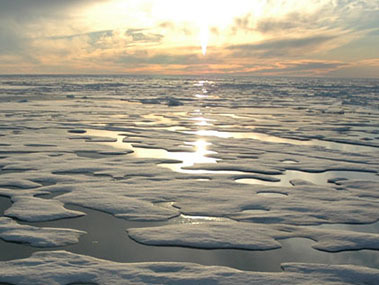 Within and beneath the waves lie proven reserves of conventional, non-renewable energy stores, as well as the promise of clean, renewable power—generated by the ocean’s mechanical energy (the physical movement of water in waves and tides), and by its thermal energy (the heat absorbed from sunlight shining on the sea). Seen from above the Earth, a hurricane has a soft, serene beauty. 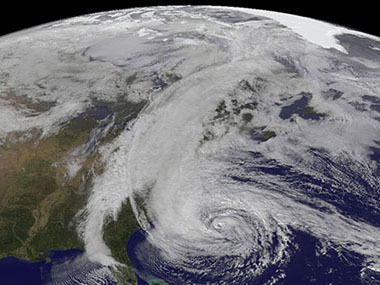 But experienced from within, hurricanes display a relentless and terrifying violence.Hurricanes are severe storms forming over tropical oceans between 5 and 20 degrees latitude, defined by high velocity winds that rotate around a central, low-pressure core. Named after Huracan, a Caribbean god of evil, these are the largest storms on Earth. Churning across oceans and sweeping over continents, hurricanes combine the energies of wind and water into an irresistible force. 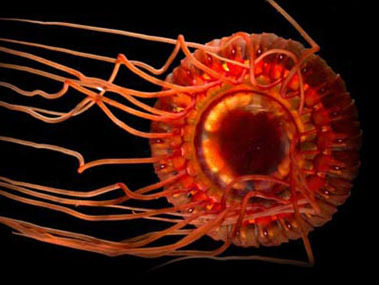 The landscapes found deep beneath the ocean are as dramatic as any found onshore. Jagged peaks loom high above the seabed, and rolling volcanic highlands give way to the muddy plains of the abyss. 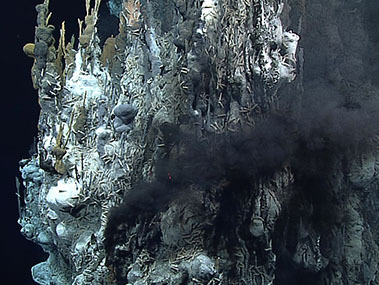 Among the most imposing seafloor features are ancient, mostly extinguished, volcanoes. Some are jagged or flat-topped cones, while others rise in a series of long, serrated ridges. Many stand alone, but most are gathered in long meandering chains. 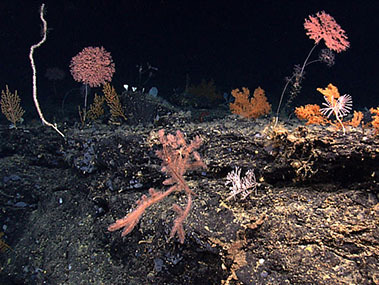 Volcanoes that are taller than 1,000 meters, but still hidden beneath the waves, are called seamounts, tens of thousands of which are scattered throughout the deep-sea, in every ocean on Earth. Seamounts profoundly influence the environment around them—they are biologic storehouses, home to diverse and abundant animal communities. Click here for image, video, and animation credits.